This image illustrates Washington's life as a young surveyor. Washington is looking through a circumferentor set on a tripod. 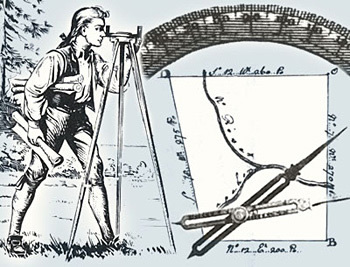 A portion of a circular protractor arches across the top and a proportional compass sits on a survey completed by Washington for Henry Enoch in 1759. As far as we can tell from the pages and pages of definitions and problems in the exercise books, a great deal of George's school work was in math. His knowledge of geometry led to a prestigious and profitable career as a surveyor. Because so many people in Virginia wanted to move "west," (in the 1750s, this meant over the Blue Ridge Mountains--link to map of settlement in 1750), official measurements and records of land were in great demand. When he was only 17, Washington accepted a position as a "county surveyor." In the early spring and late fall, when the foliage was thin and visibility was good, Washington would travel by horseback to the areas he was to measure and describe. At least three assistants accompanied him: two "chain carriers" used a 33-foot long chain of wrought iron to measure the lines of the parcel, and a "marker" notched trees along the boundary of the property. In the three years he spent as a surveyor, young George earned a large sum of money and also acquired over 2,000 acres of land for himself. Later in life, Washington used his surveying skills to measure his own property and farms, and his familiarity with approximating distances and using a compass aided him in the French and Indian and Revolutionary Wars.